Hurray! I'm 12 weeks, that means that at the end of this week I'll be entering the second trimester, how exciting! I've been doing pretty well this week, and an interesting new way that I'm experiencing morning sickness is that, I'm not having that horrible yucky nauseous feeling all day, but everyone once in a while even though in general I'm feeling great I just have to run to the bathroom and throw up. It's so weird. This morning I was feeling fine had breakfast, an hour later I decided to get off my computer and go take a shower. As soon as I stood up I knew something was going to come up, so I ran to the bathroom and lost it all, so yucky! Another irritating thing about this random barfing is that it seems every time I throw up I pull a muscle in my jaw on the left side and then it hurts to open and close my mouth for the rest of the day. Nothing else too exciting or new from this week, just glad to be another week further with everything going well. So here are the pics from this week. Here is the new timeline picture, what do you think? A bigger version of this weeks belly pic! The email subscription is working. I've gotten emails for your past updates and both text and pictures are there. Yeah!!! Oh wow! 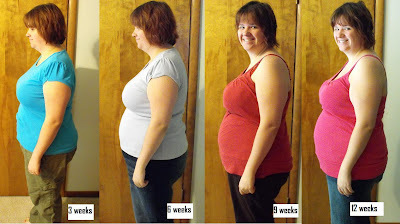 It's amazing how much of a difference you can see in your belly in just 12 weeks!! candiss - the "stranger" that you speak of meji - it's jill. and you should get toe extensions.